The babskin V Shaped Pillow Cover is ideal for use with the babskin V Shaped Nursing Pillow and other V or L shaped support and nursing pillows. The cover is made from soft white fabric which is machine washable. The fabric while soft is durable ensuring you of long lasting quality. 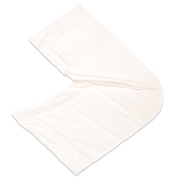 The babskin V Shaped Nursing Pillow Cover is proudly manufactured in the United Kingdom.